XAT Essay Writing is one of the major hurdles that students face when preparing for XAT. Entrance tests for MBA are on full swing and the last one in this series is XAT. For all the students who did not do well in CAT, XAT is a golden chance to redeem themselves. Along with Xaviers, a lot of esteemed B-schools such as SP Jain, IMT, MICA etc., accept both CAT and XAT scores for their admission process. It is popular amongst the students that among all the entrance exams for MBA, XAT is the hardest and probably for the right reasons. Unlike other MBA entrance tests in India, XAT contains two sections that are nowhere to be found in other entrance exams, Decision Making and Essay Writing (Most of the B-Schools conduct a WAT session once you are shortlisted on the basis of your percentile). The paper for XAT is divided into two parts, Part I and Part II. While calculating the percentile, only Part I is considered. Part II will be considered once you are shortlisted on the basis of your percentile. Part I comprises of QADI, Verbal Ability and Reasoning and Decision Making. Part II is comprised of General Awareness and Essay Writing. You have 40 minutes to attempt the second part, 30 questions from General Awareness and a 200-word essay are to be completed in those 40 minutes. The topics given for XAT Essay Writing are general or abstract so you are allowed to have a broad perspective. 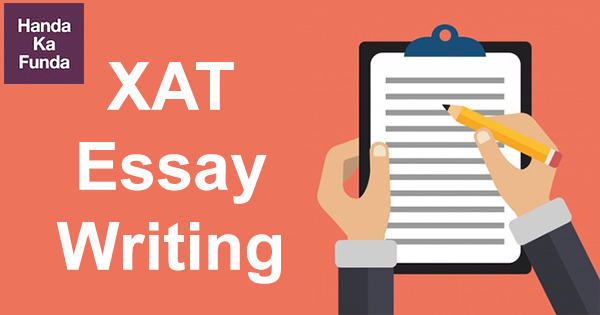 The purpose of Essay Writing in XAT is that along with your language skills, the panelists also get to analyze your thinking process, whether you are capable of putting your thoughts in a logical and reasonable manner or not. In this way, they get to understand certain bits of your personality which helps them with your assessment during the Personal Interview. Since the topics given in XAT Essay are mostly general, you start getting a lot of ideas. This is where students create the worst mistake, they put in a lot of ideas in a 200-word essay and create a “khichdi” of the essay thus leading to the obvious doom. An essay written with an improper structure makes for a bad reading, thus creating a bad impression on the examiner. In your first paragraph, give the examiner a fair idea of what you are trying to accomplish through this essay. In the following passages, expand on the ideas that you suggested in the first paragraph. Remember, you have a word limit of 200 words, so, make sure that your thoughts concise and not all over the place. Never make the mistake of ending your passage with an improper conclusion. Conclude the essay in the end by keeping in mind all the points that you discussed in the above paragraphs. When you start writing the essay, remind yourself that the examiner has to go through thousands of essays, most of them poorly written in some or the other way and might be in a bad mood. You sure don’t want to be the cause of it getting worse (Consequences might be severe for you). To create content for good reading, it is important that the writing is interesting throughout. From thousands of boring and sleep inducing essays, make yours interesting to get the extra edge over other MBA aspirants. P.S. : Maintain a neat handwriting while writing your essay (Let’s not make the examiner strain their eyes!!). In the three weeks that are left for XAT, make it a habit to religiously write one essay everyday and get it examined by your mentor/teacher/guide so that they can point out the mistakes that you are making and then you can improve upon those mistakes by seeking guidance from them. Read articles from newspapers such as The Hindu, The Indian Express etc. and analyze the writing styles from the articles written in these newspapers. Not only will you get familiar with the structure of an essay but your knowledge bank will also increase thus helping you during the GD-PI process for B-Schools. 2013 Corruption is the root cause of economic slowdown in India. 2014: The most beautiful thing can neither be seen nor be touched but can only be felt. 2015: Listening is a dying art. We hardly listen to understand. We only listen to refute or reply. 2016: Technology and Nature are natural enemies. 2017: Globalization and Jingoism always coexist.